Since I have yet to get back to a regular blogging schedule (it's always something, right?) I figured I'd at least try to do a weekly outfit post. 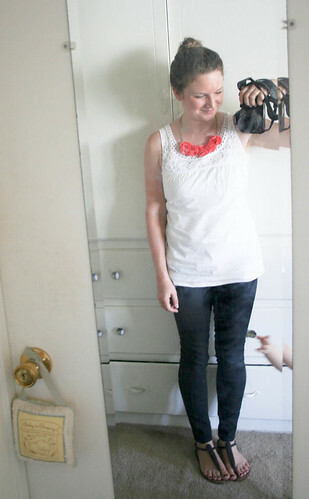 So, I'm linking up with The Pleated Poppy to show you what I wore…today. Perhaps this will also inspire me to put on an actual outfit during the week. And make my husband realize he did not marry a frumpy old vagabond woman. It should also be noted that in the above photo Eisley was distracting me from my photoshoot by trying to get me to unlock my iPod for her so she could delete all my apps and maybe tweet something vaguely inappropriate (like she did yesterday morning, so help me God). I just recently rediscovered this necklace I made, and I'm a wee bit obsessed. If you'd like to make one yourself, you should try out Little Miss Momma's tutorial over here! Or, you know, just show up at my door with some sangria and some sort of garlicky type of breadsticks and we can make some ruffly necklaces together. Yes? Yes. When I did my hair this morning I had every intention of rocking some sort of stylish top knot, but then I realized that I'm not actually that cool. Nor does my hair work out when I actually want it to. So, this is my tiny old-lady bun. I know what you're thinking. "GIVE ME A TUTORIAL ALREADY!" Yeah, no. The gloriousness of my awkward bun will remain a mystery until the end of time. You can thank me later. Ah, the tiny old lady bun. I am a master at that. Also, I love my F21 skinnies -- although Urban Outfitters is moving in for my top spot. SO, SO funny! I love Eisley's tweet and the "old lady bun" tutorial. CUTE! 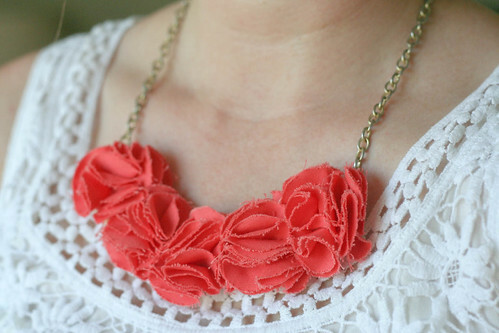 I can't wait to try making a ruffle necklace (key word=TRY). That bun is my go-to 90% of the time. That necklace is so cute! 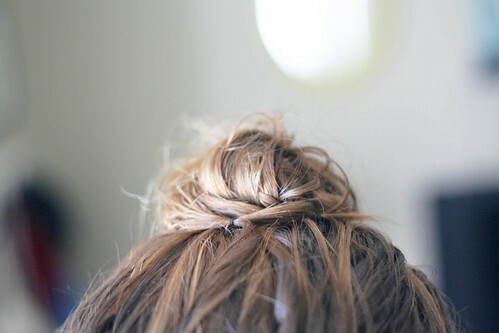 And I've already accepted that my hair will never be long enough for the ever-so-popular top knot. I'm lucky if it's long enough for a ponytail! and that bun! hehe. i love it. Is it creepy I may or may not have a small folder of "Style Icons" on my laptop that may or may not have lots of your outfit photos? I'm gonna vote not creepy, for the sake of conversation. The tiny old lady bun is adorbs. That's a cute outfit! And I saw that link for what your daughter wrote, that is very funny! Gosh, she's on twitter already! hehe.